The US has announced a resumption of military aid to Thailand, hours after a new democratically elected government was sworn in there. Washington suspended the aid after the Thai military ousted leader Thaksin Shinawatra in a bloodless coup in September 2006. The sanctions were an automatic step under a law banning such aid to nations where elected leaders had been deposed. But funding for counter-terrorism work and joint exercises remained in place. The move came hours after Prime Minister Samak Sundaravej and his new cabinet were sworn in by the Thai king. US Deputy Secretary of State John Negroponte "certified to Congress that a democratically elected government has taken office in Thailand", state department spokesman Tom Casey said. "We congratulate Thailand's new cabinet on its inauguration, and the Thai people on their success in re-establishing an elected government," he said. The new cabinet is packed with lawmakers loyal to the ousted Mr Thaksin, following victory by his allies in December general elections. 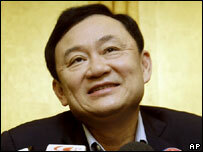 Mr Thaksin remains in self-imposed overseas exile.